The new flag can be seen on teh Canadian Public Register website: http://archive.gg.ca/heraldry/pub-reg/project.asp?lang=e&ProjectID=1300. 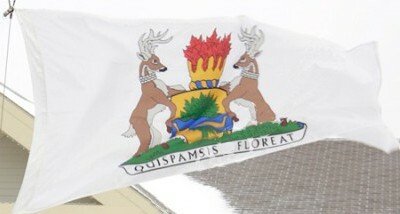 Yet another flag of the Town of Quispamsis, New Brunswick: http://telegraphjournalphotos.com/gallery2/v/2009/january2009/010109/0102pwquispamsislevee01.jpg.html. Instead the granted flag as shown above, the town uses simpler version of white flag with new coat of arms.